неделя, 31 март 2019 г. Follows a sketch. My drawings were awful and the only one acceptable was on checkered paper! So I embraced the possibilities of the sketching software - I took a picture of the drawing, imported it to the SketchBook and this is the result. Следва рисунка. Скиците бяха ужасни, а единствената що-годе приемлива беше на карирана хартия. Тогава се възползвах от възможностите на таблета си - снимах скицата, импортирах я и се получи това. 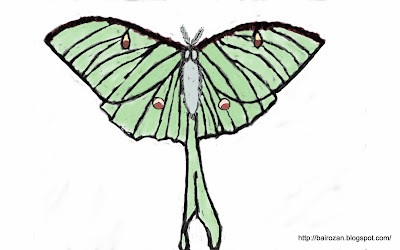 The colors of the Luna Moth reminded me of a flower brooch I had made a long time ago. Цветовете на тази нощна пеперуда ми напомниха на една отдавнашна брошка от плат. Rozantia -> You are here! / Това съм аз! Публикувано от bairozan в 17:36 ч. Cat 31 март 2019 г., 18:33 ч.
I would never have thought of a wire wrapped piece and the sketch is pretty! bairozan 1 април 2019 г., 10:04 ч.
Jennifer Cameron 31 март 2019 г., 19:14 ч.
I love how your husband was so proud of it and showing it to everyone, that's so sweet of him! I love the brooch and I actually quite like the sketch too and think it would make a great print. I didn't even try to draw one myself. If I have to be even a little bit symmetrical, it is not going to go well at all. Thanks for participating in the challenge again this month! bairozan 1 април 2019 г., 10:08 ч. Thank you, Jennifer! My husband is quite honest and never spares me a negative comment, so I know he really likes the brooch :) A print, um? I'm glad you think so! Cathy Spivey Mendola 31 март 2019 г., 19:21 ч.
I am in awe of anyone who can do wirewrapping especially with beads. Your brooch is sweet & I love that your husband is so proud of it. Great idea to take a photo of your drawing and import it. I think it's a beautiful sketch. bairozan 1 април 2019 г., 10:14 ч. Thank you, Cathy! Yes, my husband was more excited about it than I was :) I'm really glad I went with the sketching software, it worked! Saraccino 31 март 2019 г., 19:45 ч.
bairozan 1 април 2019 г., 10:16 ч.
Lesley 31 март 2019 г., 20:51 ч.
Caroline 31 март 2019 г., 23:59 ч. Love the brooch. I'd wear that all the time! bairozan 1 април 2019 г., 10:18 ч. Chic Chix and Champagne 1 април 2019 г., 17:07 ч. All three of your inspired pieces are brilliant, each in its own way! I love the colors in your flower! 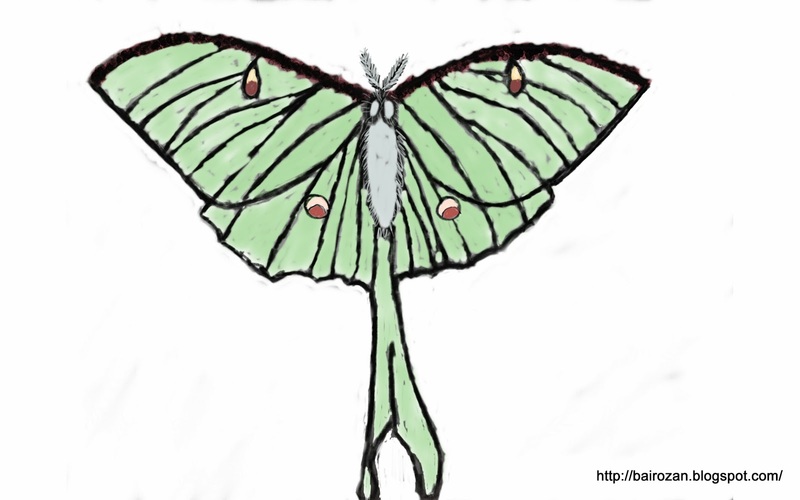 I wanted to use some Luna Moth green beads I have in a project and just didn't have time. bairozan 1 април 2019 г., 17:37 ч.
Divya N 1 април 2019 г., 17:37 ч.
bairozan 2 април 2019 г., 15:19 ч.
I'm so glad I remembered the fabric brooch from ages ago, I have the same feeling about it! Unknown 3 април 2019 г., 18:57 ч. Love that Luna brooch! How sweet! bairozan 3 април 2019 г., 20:08 ч.
CraftyHope 5 април 2019 г., 4:38 ч. Beautiful job with these pieces! I do really like the beaded moth. I hate that you're not happy with it. At least you tried this challenge, I couldn't bring myself to do it. You totally did better than me by just trying. That's a win! bairozan 5 април 2019 г., 13:21 ч.